Our research and clinical trials are not about laboratories and test tubes – they are about real people fighting disease and getting access to the most effective treatments. Since 1991, our key priority has been to conduct research to find safe and effective treatments for GI cancers with the aim of improving medical practice and patient care. Our 2018 research priorities are available here. Change standard medical procedures 3 to 5 years earlier, if trials are in Australia. We have clinical trials in various stages of progress: in activation, open to patient recruitment, in follow up and completed trials. Phase 1 is sometimes written as phase I. They are usually small trials, recruiting only a few patients. The trial may be open to people with any type of cancer. Patients are recruited very slowly onto phase 1 trials. So although they don’t recruit many patients they can take a long time to complete. The first few patients to take part (called a cohort or group) are given a very small dose of the drug. If all goes well, the next group have a slightly higher dose. The dose is gradually increased with each group. The researchers monitor the effect of the drug until they find the best dose to give. This is called a dose escalation study. In a phase 1 trial you may have lots of blood tests because the researchers look at how the drug affects you. They also look at how your body copes with, and gets rid of the drug. They record any side effects. People taking part in phase 1 trials often have advanced cancer. They have usually had all the treatment available to them. They may benefit from the new treatment in the trial but many won’t. Phase 1 trials aim to look at doses and side effects. This work has to be done first, before we can test the potential new treatment to see if it works. Not all treatments tested in a phase 1 trial make it to a phase 2 trial. Phase 2 is sometimes written as phase II. These trials may be for people who all have the same type of cancer or for people who have different types of cancer. Although these treatments have been tested in phase 1 trials, you may still have side effects that the doctors don’t know about. Drugs can affect people in different ways. Some phase 2 trials are randomised. This means the researchers put the people taking part into treatment groups at random. One example could be that 6 out of 100 more people (6%) get a remission with a new treatment compared to standard treatment. If there were 50 people in the new treatment group and 50 people in the standard treatment group, there may be 3 more people in remission in the new treatment group. The 2 groups would not look that different. But if the researchers gave each treatment to 5,000 people, there could be 300 more remissions in the new treatment group. Sometimes phase 3 trials involve thousands of patients in many different hospitals and even different countries. Most phase 3 trials are randomised. This means the researchers put the people taking part into treatment groups at random. Click here to view and search for participating trial centres. 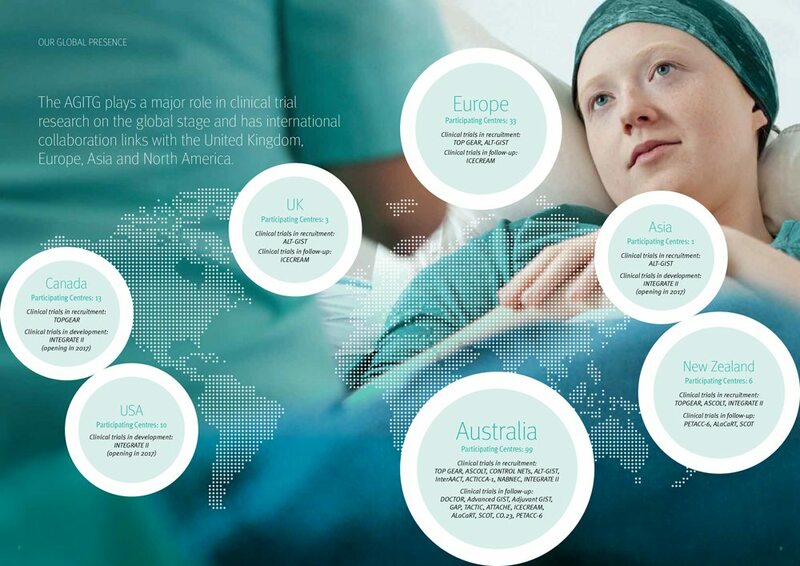 In addition to the Asia Pacific, we play a major role in clinical trial research internationally, working with researchers in the United Kingdom, Europe and North America. To find out more about developing our research, click here. One of our greatest challenges is lack of Government funding. Your support is vital in funding our research and continuing clinical trials, now and into the future. To show your support you can donate here or learn more about getting involved here. Adjuvant/Neoadjuvant Neoadjuvant Therapy Treatment given as a first step to shrink a tumour before the main treatment, which is usually surgery, is given. Adjuvant Therapy Additional cancer treatment given after the primary treatment to lower the risk that the cancer will come back. Advanced Disease Advanced disease (cancer) that has spread to other places in the body and usually cannot be cured or controlled with treatment. Rare Cancers A rare cancer is defined as a type of cancer that has less than 6 incidences per year per 100,000 population. If you have any questions or think a clinical trial may be relevant to your situation, it’s important to ask your GP or oncologist. They can discuss the available options with you and have access to information about current trials and research.